I would agree that Raj Bhavsar’s journey has been remarkable, although for those that knew what the American team was capable of, it was not so much fairy tale as it was the conclusion of an inspirational movie script. 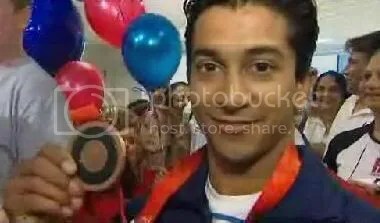 Seeing the welcome party, Raj remarked that it was just starting to sink in that he really is an Olympic medalist. That’s a sentiment shared by many Americans as they saw a great gymnast and role model receive the award that he had deserved for so long. It would be great to hear Raj Bhavsar do motivational speaking as he has an amazing story to tell. See Olympian Raj Bhavsar for more background information. The American 10m platform divers at the Beijing Olympics are getting people excited. One reason is that they have medal potential in the individual event. 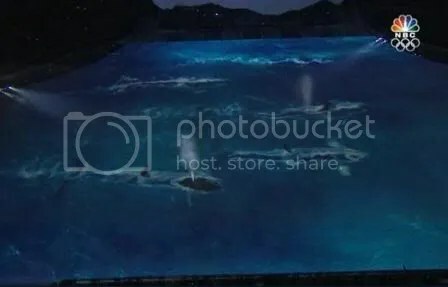 The other reason is that a lot of people are finding the pair of Thomas Finchum and David Boudia to be very attractive and a convincing reason to watch barely covered men jump off a three story platform and hurl themselves towards the water at 30 miles per hour. 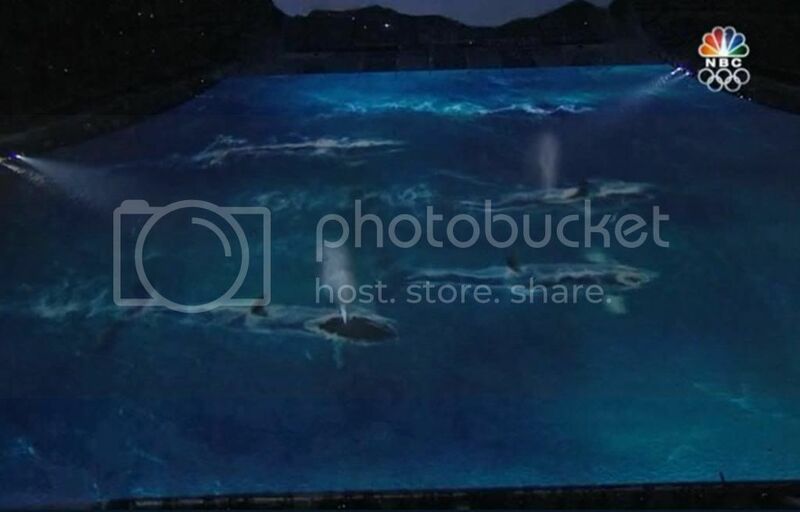 Unfortunately, their swimsuits appear to be held on with superglue because that huge resulting impact has not been enough to dislodge the swimsuits one bit that we could see in the underwater shots. Therefore we will try to be content with focusing on the diving skills. David Boudia, a 19 year old from Noblesville, Indiana. usually does a list of six dives that equals the highest degree of difficulty ever recorded. The list is rated even more difficult than that of Greg Louganis. More importantly, the collective difficulty of Boudia’s list of dives is even higher than that of the Chinese divers, who had won all seven gold medals at the Beijing Olympics up to the last event, which is the men’s 10m platform. 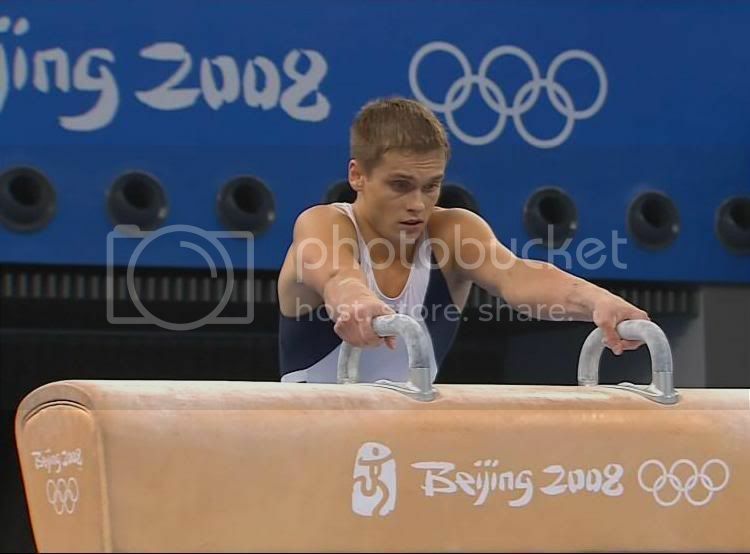 Boudia’s total degree of difficulty is 21.0. That ties Sascha Klein, a 22-year-old German who won the World Cup, for the highest ever. When Boudia can do a superior job executing, the DD and execution gives him a good opportunity to medal. American divers haven’t won any Olympic medals since Sydney. 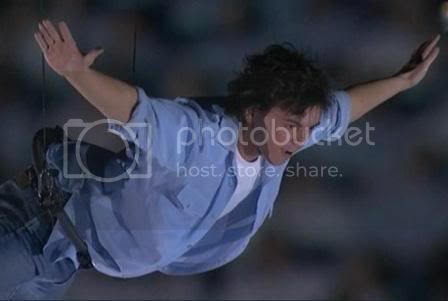 No male American diver has won a medal since the 1996 bronze on 3-meter by Indiana University graduate Mark Lenzi. With no U.S. medals won in 2004, the Indianapolis based USA Diving organization moved the national training center to Indianapolis and encouraged the country’s elite divers to move there to train together. We haven’t seen medal payoff yet, but things are definitely looking better. In the preliminaries for the 10m, David Boudia and Thomas Finchum finished sixth and seventh with 481.70 and 477.00 points, respectively, which secured them a spot in the semifinals. Whew! The top 18 advance. In the semifinals the field will be trimmed to 12. Zhou Luxin of China led the qualification with 539.80 points. Australia’s Matthew Mitcham was second, with 509.60, and Russia’s Gleb Galperin third, with 499.95. In the semifinals, David Boudia finished fifth and seventh with 491.55 and 474.95. That put them comfortably in the top 12 that advanced to the final. 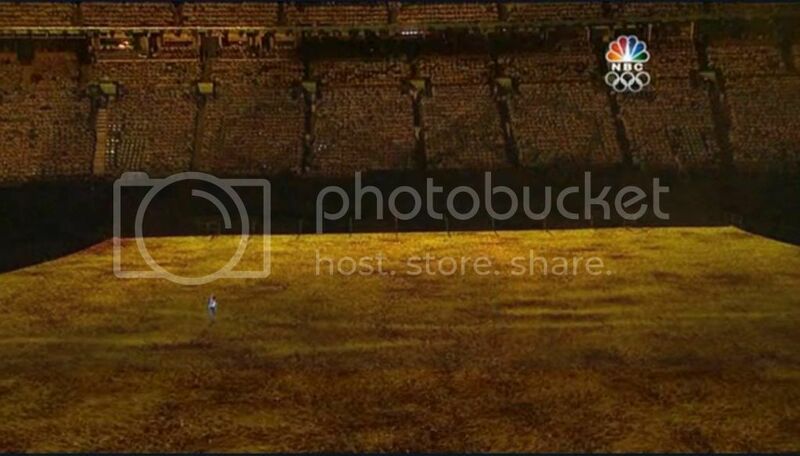 Alas for the Americans, in the final it was not to be. Matthew Mitcham pulled out all of the stops and did an incredible sixth dive to grab the gold. With a 3.8 DD he received 4 10’s and 2 9.5’s to get an astronomical score of 112.10 for it. That was enough to push him in front of China’s Zhou Luxin, who had a terrible sixth dive (for him) and who then got the silver. Russia’s Gleb Galperin had a very impressive 6th dive, which placed him above China’s Huo Liang and earned Galperin the bronze. Troy Dumais, America’s best hope for a medal in the men’s 3m springboard, finished in 6th place for his third Olympics in a row. Being 6-6-6 in anything is not the best situation to be in, but at least Troy has a good quality about him. He’s big in the sport of diving. Like really, really big. See under the cover coverage of Troy Dumais and Alex Despatie at the Olympics for more explanation. America’s other entry, Chris Colwill, brought up the rear in 12th (last) place. The Sino-stoner impersonation team of Qin and Chong finished 1st and 3rd, while Canada’s biggest diver (and again I stress big [see above link]) Alexandre Despartie finished 2nd for the silver. Rounding out North America, Mexico’s Yahel Castillo ended in seventh place. Yahel is big everywhere. Especially nicely in the badunkadunk. 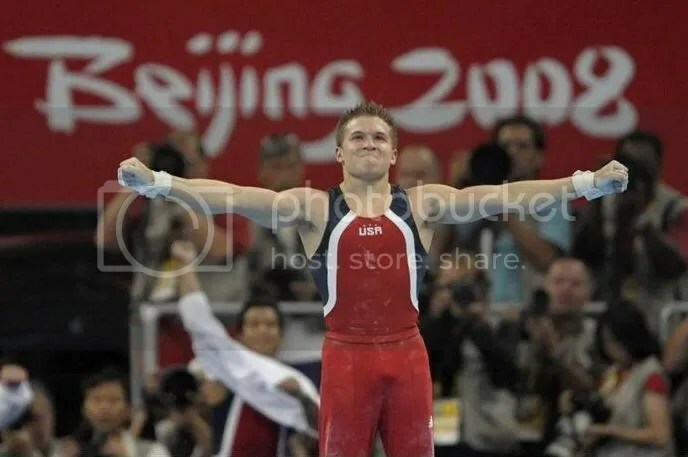 In the artistic gymnastics men’s team competition at the 2008 Beijing Olympics, the United States was able to earn a bronze medal through superior achievement by Jonathan Horton, solid performance by Raj Bhavsar and a nerve-wracking clutch routine by Alexander Artemev. Among other things, Jonathan Horton‘s high bar routine was stunning and his triple twisting double layout dismount was absolutely breathtaking. After doing his twists while hurdling towards the ground, Horton manged to stick his landing as if the floor was a super-magnet and his feet were made of iron. The mat and Horton’s feet locked and his 5’1″ body wasn’t going anywhere except to an erect display of triumph. Raj Bhavsar did everything he needed to do to show that he had always deserved to be representing America, delivering his usual high quality results. This despite his age and the mind games that USA Gymnastics have played with him in selecting the Olympic team. Sasha Artemev came through when he needed to, on his specialty apparatus the pommel horse, in the last rotation, as the last American to perform. The American’s medal chances rested on Artemev’s shoulders and it was anything but certain on how well Artemev would do. He had had widely inconsistent performances on the horse in 2008, at the national championships and the Olympic trials. Would he be the dazzling gymnast he has shown he can be or would he be the choking goat that cost him teammates a third place finish? Fortunately for all involved, except for the fourth place Germans, Artemev was on top of his game and wowed the crowd. It was enough to ensure the U.S. team would stand on the medals platform. Alexander Artemev and Jonathan Horton also qualified for the all-around competition and two of the finals for individual apparatus (Artemev on pommel horse and Horton on horizontal bar). In the all-around, Horton finished 9th out of 24. He was 4/10s of a point away from a silver medal. If he could have gotten even a middle of the road score on his lowest apparatus, the pommel horse, he could have easily gotten second place. Artemev ended up in 12th. Three days later in the pommel horse final, Artemev finally flung himself off of the apparatus in what may become known as the Artemev Fling, as he does it so often. Fortunately, it occurred on the apparatus final and not during the qualifications or team final. He finished 7th out of 8. While it would have been nice for an American to win a medal, Louis Smith’s bronze was the first individual medal in gymnastics in a 100 years for Great Britain, so he and his country probably needed it more.